The 2017 Honda Ridgeline is in stock at Brilliance Honda in Crystal Lake. 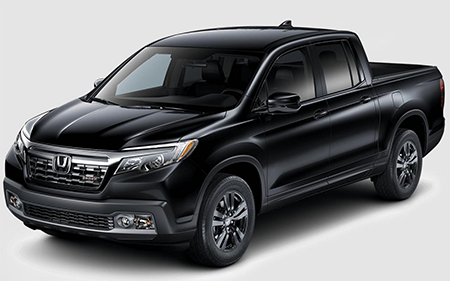 The Ridgeline is available in a variety of trim levels, and the Sport has its own list of features and advantages. This version offers dashing good looks and some premium amenities, so find the Ridgeline Sport at Brilliance Honda of Crystal Lake, just a short drive from Elgin, IL. Every Ridgeline is powered by a direct-injection 3.5L V6 that makes a generous 280 hp and 262 lb-ft of torque. That much power helps the all-wheel drive version of the Ridgeline haul up to 1,580 pounds and tow up to 5,000 pounds when properly equipped. With front-wheel drive and the standard 6-speed automatic transmission (6AT), the EPA estimates that the Ridgeline Sport will earn up to 19 mpg city/26 mpg highway/22 mpg combined with front-wheel drive*. With all-wheel drive and 6AT, the Ridgeline Sport gets up to 18 mpg city/25 mpg highway/21 mpg combined in EPA testing*. The Honda Ridgeline Sport is equipped with a multi-angle rearview camera, stability and traction control, and head restraints in all seating positions. It even includes a tire-pressure monitoring system which lets you know when the air in your tires is low. You can find the Ridgeline Sport now at Brilliance Honda of Crystal Lake. We’re located at 680 W. Terra Cotta Ave. in Crystal Lake, IL, and we’re happy to help you find the right Ridgeline that’s best for you. Stop by our showroom today, or contact us to find out more!